First published by the Duke Nicholas School of the Environment. Alligator Gar are so cool. Their wide snouts really do make them appear like a cross between a fish and an alligator, and they are rarely seen by people unless you know exactly where to look. 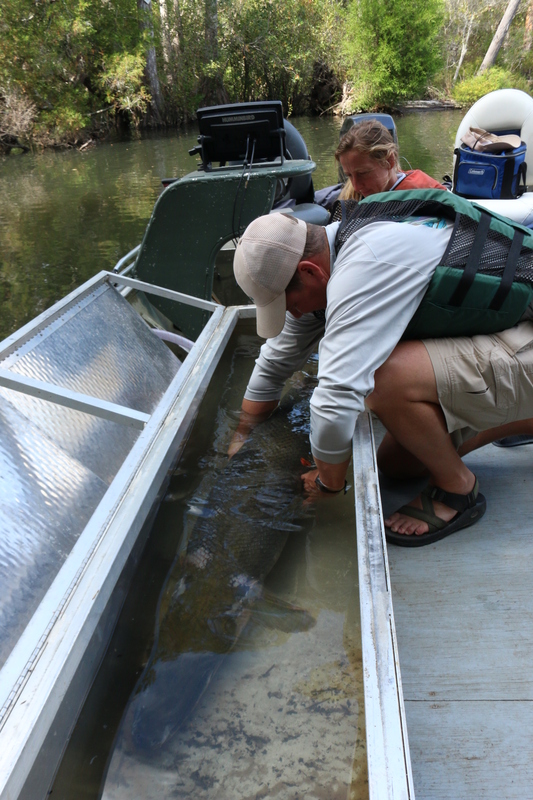 In fact, it took Florida Fish and Wildlife Conservation Commission (FWC) biologists months to actually capture their first Alligator Gar within the Yellow River system. After a long period of empty nets, FWC staff used a gar caught in another river to find them. This “Judas fish,” once released in the Yellow River, was used to locate nearby gar individuals. I visited the Blackwater Fisheries Research and Development Center in Northwest Florida to watch the release of two such Alligator Gar on two separate mornings. 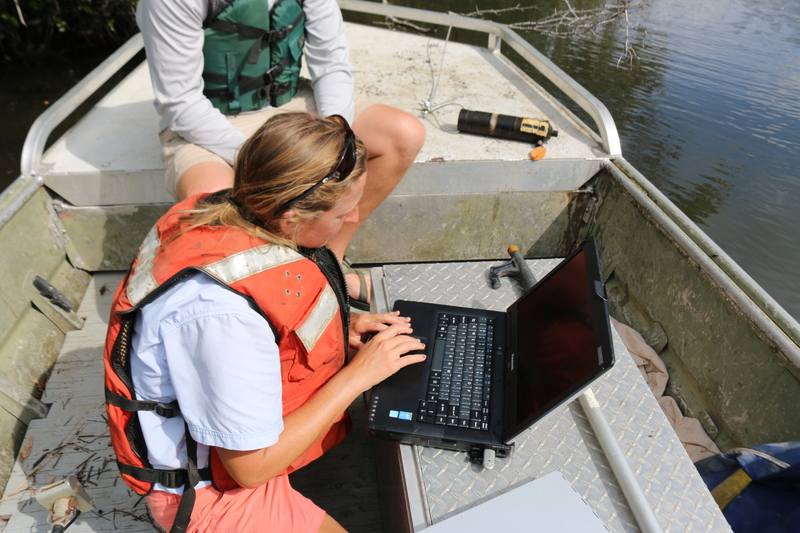 The fish had been implanted with transmitters, and would now be monitored in order to estimate gar populations in the Yellow River. In the nearby Escambia River, there are only around 250 individuals; hopefully there will be more found in the Yellow! While I was fascinated by the science, when an Alligator Gar is around I become completely mesmerized. They are long but incredibly tough, covered in scales so thick it’s nearly impossible for the researchers to actually insert the transmitters and additional tags. A row of sharp teeth sticks out of their mouth-line, but they do not intentionally attack people (unlike what is portrayed in the popular River Monsters show). The gar can breath air, and I love watching as they slowly float to the surface and take a giant, comical gulp. The second gar I watched swim to freedom was Mariposa, named using the Spanish word for butterfly. The biologists tend to use whatever pronoun is associated with the name they choose (it’s difficult to tell what gender a gar is unless you dissect it or plug its measurements into a formula), and so we thought of Mariposa as “her” as she slowly swam away from the shore, surfacing once to breath before disappearing beneath the tannin-filled water. When working in the natural world, it is important to retain our sense of awe and mystery at the wealth of life that surround us. I certainly felt that way watching the powerful fish return to her home. How fascinating. I’ve never heard of them.